Airlines across the Northeast pre-emptively canceled 5,200 flights on Monday morning. Statewide travel bans were put in place in Connecticut, Massachusetts and Rhode Island as hotels became shelters for travelers. The Radisson Hotel JFK Airport was ready as cities across the Northeast announced the suspension or reduction of public transit. The hotel provided guests with FlyteBoard real-time airline flight information and a recently upgraded display with live Doppler radar from Flyte Systems. Flyte Systems is the leading provider of cost effective airport travel information displays and digital signage content for the hospitality, digital signage, and convention center industries and related businesses. Click here to request information on Flyte Systems’ airport travel and guest information services. “Air travel in winter months adds a dimension of stress for anyone, seasoned or not,” said Scott Triphahn, vice president of Flyte Systems. “Having a real-time glimpse of your flight’s status removes some of that anxiety and gives you a heads up if flights are delayed,” he said. “Why not know in the comfort of your hotel, before you check out, to find your flight is delayed or cancelled? 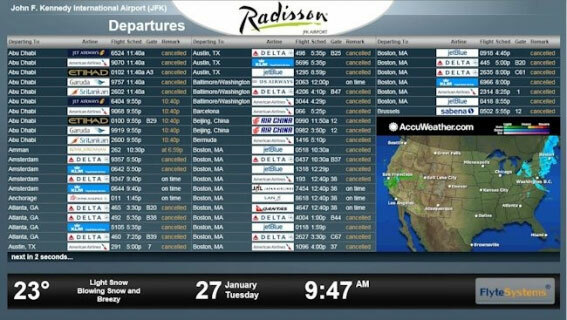 Knowing before others might get you up in front of the line for that next flight or even let you book an extra night’s stay if a storm hits and you’re done for the night.” FlyteBoard displays cities, flight numbers, schedules and actual arrival and departure times, airline logos and gates identical to airport terminal screens.